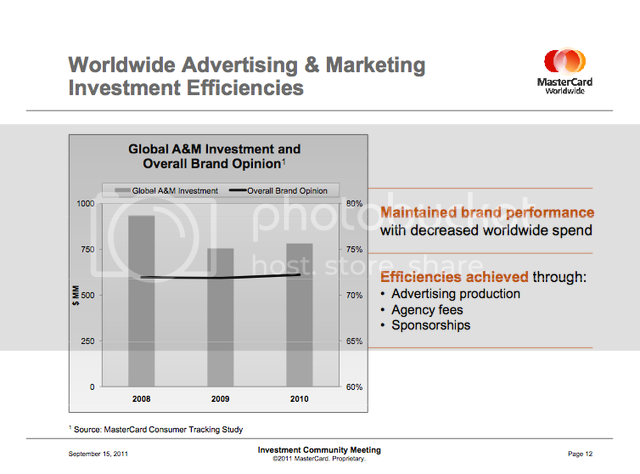 MasterCard International CMO, Alfredo Gangotena, made a lengthy presentation last week here in New York. One of the interesting factoids that peaked our interest was this one: between 2008 and 2010, the company reduced marketing by 20%, to which it credits "focusing on greater efficiencies, such as advertising production agency fees or much better use of our sponsorship assets." Of course, it's not hard to slash costs, but Gangotena says brand opinion increased over that three year period of time, and is line with the company's marketing strategy of moving the brand from awareness and towards preference in mature markets. Key to building "top of wallet" preference are two things, Gangotena says: technology innovation and experiences. Many times, these two work in concert such as the case with its Priceless New York promotion, which last month placed QR codes on historical Yankee Stadium seats throughout New York City in places like Katz Deli and the New York Stock Exchange, which could be scanned for the chance to win tickets. In his words, "experiences are more valuable than things." Within Yankee Stadium, Gangotena says that MasterCard offers tied to the brand's partnership with the team, such as the Family Meals that offer, if you have a MasterCard, a free Pepsi, have lifted MasterCard's market share 60% among participating concessions since last April. So what's this mean for properties not in New York? Well, MasterCard intends to soon roll out its Priceless Cities campaign throughout the world. Priceless Cities, the next evolution of its classic Priceless campaign, will give MasterCard cardholders the opportunity to enjoy experiences such as shopping, dining, the sports, arts and culture or travel. The integrated marketing campaign will span the marketing spectrum from print to outdoor to sponsorship. "The advantage of Priceless Cities is that it caters to not just a few, but all our cardholders in gradually making MasterCard a preferred card," Gangotena says. "It's a little bit like if I were to sell you the Access card to Gorgeous New York." Click here to view Gangotena's presentation and here to read the transcript.